CNG: Printed Auction CNG 75. Severus Alexander. AD 222-235. 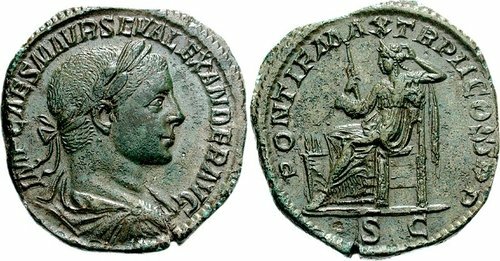 Æ Sestertius (24.96 g, 12h). Rome mint. 3rd emission, AD 223. Sale: CNG 75, Lot: 1103. Estimate $750. Severus Alexander. AD 222-235. Æ Sestertius (24.96 g, 12h). Rome mint. 3rd emission, AD 223. Laureate, draped, and cuirassed bust right / Securitas seated left, holding scepter, resting head on hand; lighted altar before. RIC IV 407; Banti 126. EF, gray-green and brown patina, hairline flan crack.